I had a particular sense of what I wanted the painting to look like. I painted the background, and went to an art store to pick up some paint markers to draw the foreground. I had in my mind that I wanted a thick glossy glaze over the front, I didn’t want it to look like a painting. I wanted it to look more like the drawing, smooth and flat on the surface. 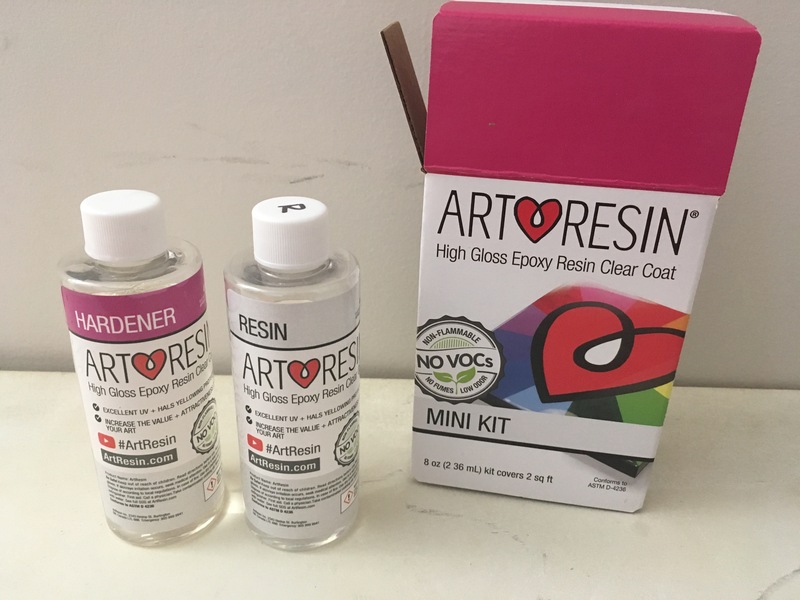 I’ve had interest in resin before, but I have limited space and ventilation in my home, and have always been under the impression that using it is precise, messy, and dangerous. However, when I was browsing the store, I happened upon Art Resin. These kits claimed to be safer and easier to use, while not yellowing over time. I thought I’d give it a shot! I also picked up a mini canvas as a tester, and whipped up a quick painting of my favourite furry lady. I tried the resin on each painting, and I wanted to share my results and thoughts on it. The process of using the resin was pretty easy. I had most of the things I needed on hand (or found some sort of substitute), but I did have to pick up some latex gloves. 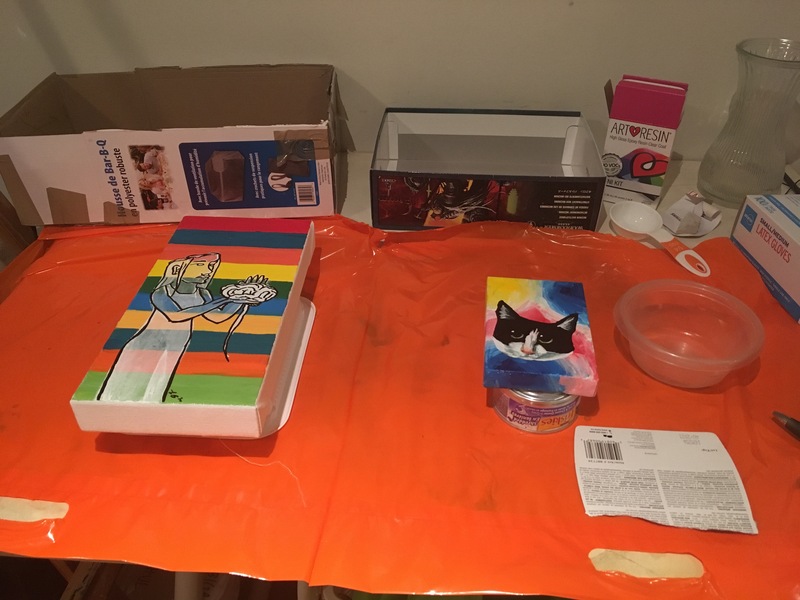 I put down some plastic, and I used cat food cans and a plastic meat tray to elevate the paintings so the extra resin would drip off. I had a level already to level the paintings, and used a piece of cardboard to push the resin around. I used a measuring cup to measure how much I needed of each. You use equal amounts of each liquid (the resin and the hardner) so it’s pretty easy to mix. Finally, I used some boxes to cover them after to keep dust out while they set. (As you can see, I had one that wasn’t quite the right size, so I modified it). The process went alright, I mixed the resin for 3 minutes, and poured on each canvas. I pushed it around with the cardboard, rubbed whatever was running down the sides around with a gloved hand, and then tried to blow as many bubbles out as possible. Art Resin does recommend using an artist’s torch to get rid of all of the bubbles (and they did have them at the store) but I wasn’t ready to commit to the purchase of a torch without knowing if I’d like the resin. So I resorted to blowing out the bubbles with my mouth. Unfortunately, I did lean too far and dip my hair in one of the paintings, but I managed to wash the resin out of my hair after. (Fewf! I will tie up my hair next time). Finally, I locked my kitty out of the basement. 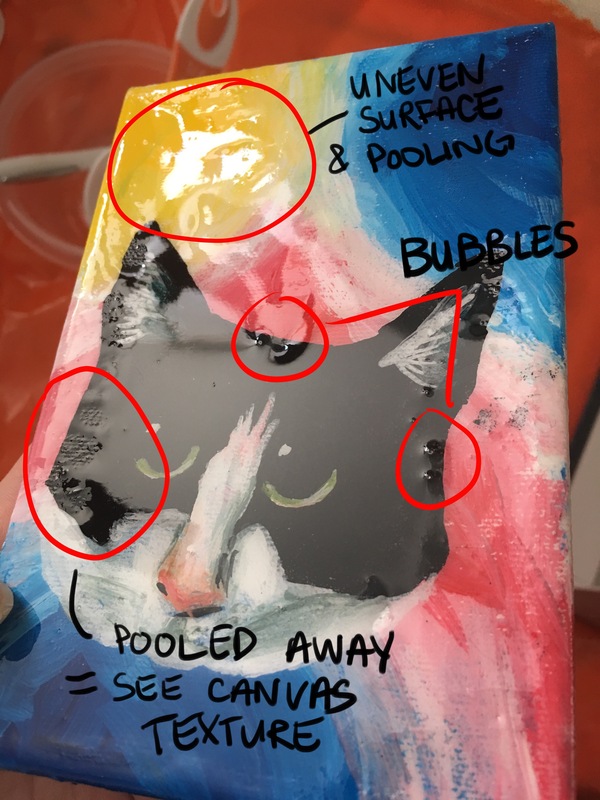 While Art Resin says it has no VOCs or fumes, it does have a bit of a smell, and it is corrosive, so I didn’t want my kitty getting into it. (Also, I didn’t want my kitty’s hair in my resin!). The kit says the resin will be tacky in 12 hours, hard in 24, and completely cured in 72. I’d say that’s a pretty accurate description. 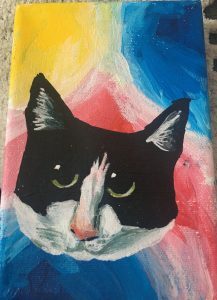 I kept my cat locked out of the basement for 12 hours, and after that I let her in the basement, but left the paintings sit under the boxes hoping kitty wouldn’t knock them over for another 12 hours. The photos I’ve taken are after 24 hours. Before resin on the left, after resin on the right. I chose the subject and colours of this 4″ x 6″ painting intentionally, as I wanted to see what resin would do to vibrant colours, as well as more subtle shading on the face. I really liked what resin did to the quality of the colours, as soon as I put it on I loved it. It really took the chalkiness out of the white paint, it makes all of the colours richer, and makes the brush strokes blend more nicely. I also loved what the resin did to this 6″x12″ piece, but for different reasons. I really wanted this piece to feel like a comic, or like the original iPad drawing, with a flat surface. By taking away the texture of the canvas, the resin really makes it feel like a digital drawing. It prevents reflection and light from breaking up the solid colours. Therefore, the stripes in the background feel much more solid and vibrant. I did learn some things from this process. 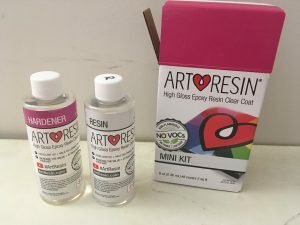 While Art Resin says it can be used on canvas, it did warn that resin can pool on larger canvases, because the weight of the resin can weigh the canvas down. Funny enough, it was actually the smaller piece had a lot of pooling of the resin. 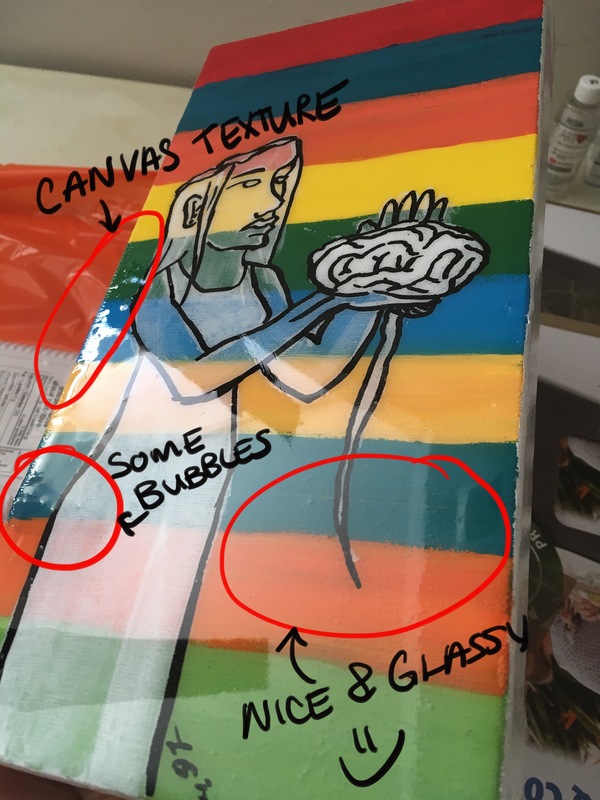 The canvas on that piece wasn’t stretched very well (likely because it was on such a small stretcher) and I thought I might have this issue even before I started. Also, as I had mentioned, I didn’t purchase a torch to pop the bubbles. While I could blow some out, many stayed behind, particularly on the smaller one. I don’t know if that’s because it had so much pooling, or if it was the first one I did. On my second painting, while I did have a few bubbles, and the resin did pull away from the canvas in a few places, it was much smoother all over, and was much closer to what I was looking for. I would definitely use Art Resin again. 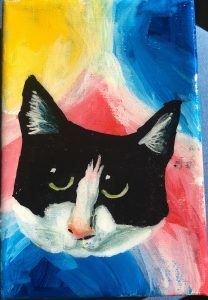 It was fairly easy to use, and I really liked what it did to the colours and textures on my paintings. I think Art Resin would make my paintings look much more professional, if done more precisely. That being said, I think I know the solutions to the issues I had (which is why I did a tester in the first place!) and I know what I would change next time. I will definitely be going out and purchasing a torch to pop the bubbles. From videos I’ve seen online, it’s very effective. I think having a bubble-free glossy surface is key to having a professional look. I will also level my paintings more carefully in the future, they could have been a touch more level, and that may have contributed to some of the canvas texture showing through. Finally, I will keep resin to wood panel and very tight canvases in the future. I do like to paint on wood panel, and I already have some old paintings on wood panel in mind that I think the resin would look great on. I particularly had this piece in mind. I made this out of thermal paper, which reacts to heat to create black. This was a cityscape I made with an iron and a hair straightener, glued to a wood panel. 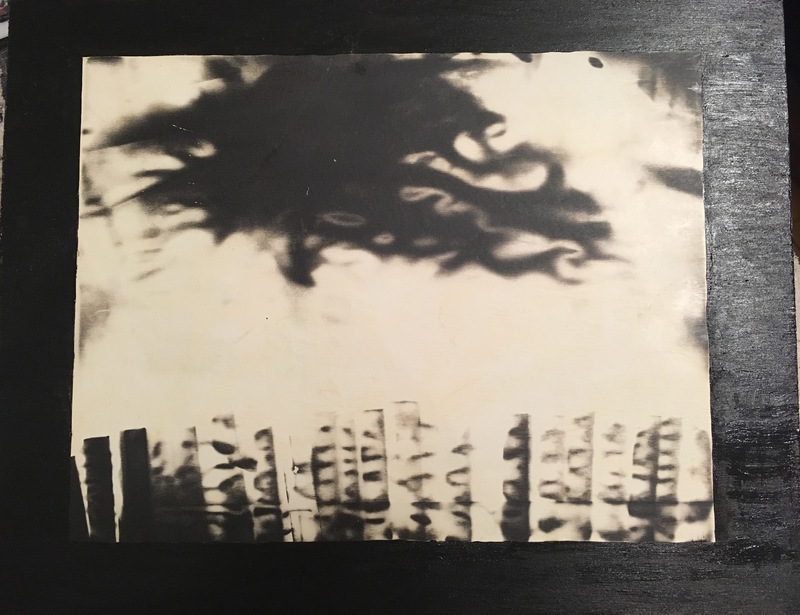 The thermal paper isn’t holding up great over time, and I think the resin would restore some of the vibrancy of the black and white, while protecting the paper from yellowing. Once I go out and buy my torch, this will be my next resin project! I had a great experience trying something new. 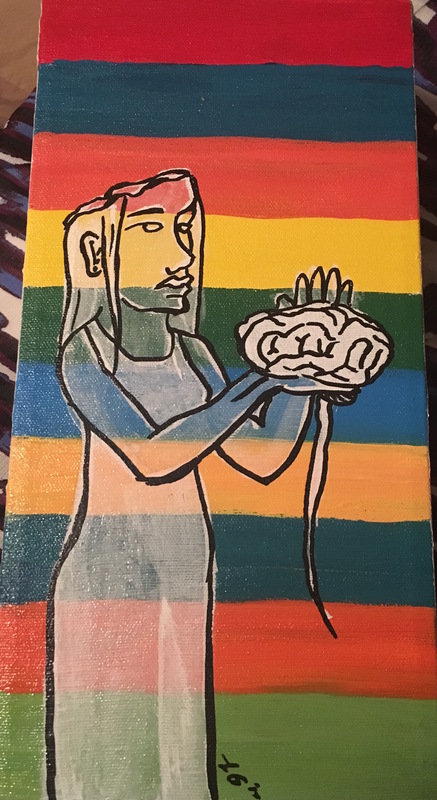 I sometimes feel that I don’t try new mediums and techniques since I’ve been out of art school as much as I would like to. 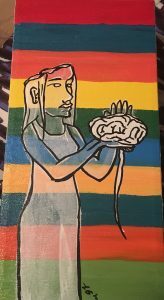 Many things contribute to this, including lack of studio space, ventilation, and exposure to different techniques that other artists use. I must say that I’m pretty happy I branched out this weekend and tried something new!